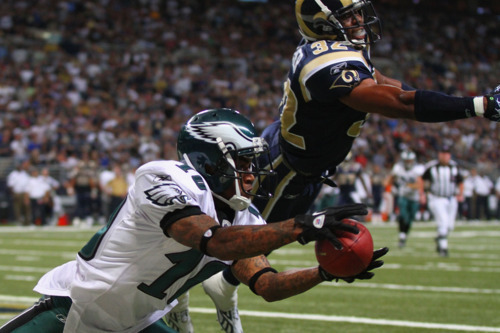 You all watched the Eagles beat the Rams 31-13 on Sunday afternoon. The score was convincing, even if the performance was more mixed. Let’s go inside the numbers to see what worked and what didn’t, and what we might takeaway for next week. 19 = The Eagles total rushing yards in the first half from running backs. That was on 9 carries for a pitiful 2.1 yards per carry. The Eagles ran a number of classic Howard Mudd stretch plays in the first half, and the blocking was horrible on almost every one. Not sure why the line looked so unprepared to handle those calls, but LeSean McCoy was scrambling like a mad man for a yard here or there. They settled down more in the second half, although mixing in some straightforward runs seemed to help. 118 = The Rams total rushing yards in the first half, by contrast. This figure is obviously helped by the big Steven Jackson touchdown run, but even without it the Rams still averaged over 5 yards per carry. By the end of the game things weren’t as bad, but that was largely because the Rams had to throw more to catch up. I’ll have to watch again to check this qualitatively, but Jamar Chaney was the only Eagles linebacker to get tackles at an above average rate. 6.7 = Rams yards per passing attempt to wide receivers. This is an astoundingly low number for a team that was trying to throw its way back into contention for most of the second half. Now, the Rams were a dink and dunk passing game last year and were plagued by drops yesterday. But for the most part the Eagles vaunted cornerbacks shut down all outside passes. 5 and 10 = Sacks and hits on the quarterback caused by the Eagles defensive line. Last season, the line had only 27 sacks and 52 quarterback hits — total. After one game, the unit is already one-fifth of the way there. 6.8 = Sack rate on all Eagles quarterback dropbacks in 2010. It was exactly the same in this game despite, or perhaps because of, the revamped offensive line. And while Michael Vick scrambled to safety (and daylight) on only 9 percent of pass attempts last year, he did so at more than twice that rate on Sunday. Many folks saw improvement in the second half pass protection, but Vick only had 8 pass attempts and 3 completions. The passing game wasn’t much more in sync. Overall, when there was pass protection to speak of, Vick shredded the Rams defense. And once the Eagles gained the lead, the attacking defensive line and shutdown corners are built to stymie any comeback. That bodes well for the future, but the offensive line and linebackers will have to improve early and often next week if the Eagles want the same result against a better team in Atlanta. Tagged with Philadelphia Eagles, NFL, Season Opener, St. Louis Rams, Week One, Michael Vick, Offensive Line, Howard Mudd, Pass Blocking, Run Blocking, LeSean McCoy, Defensive Line, Sacks, Hits, Cornerbacks, Statistics, By the Numbers. September 12, 2011 by Brian Solomon.